"YARNELL, Ariz. (AP) — A sudden windstorm turned an Arizona forest fire into an out-of-control inferno that trapped and killed 19 firefighters, nearly all of them members of an elite crew of "hotshots," authorities said Monday. It was the nation's biggest loss of firefighters in a wildfire in 80 years. 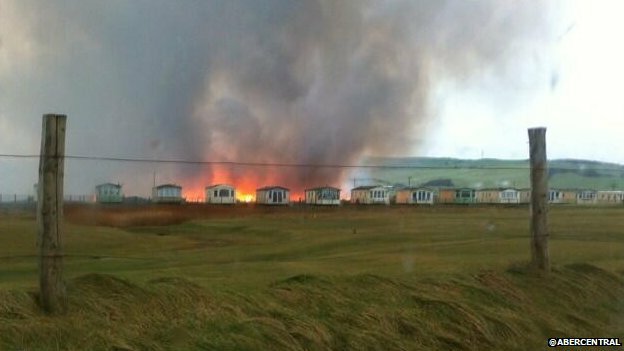 The flames swept over the victims Sunday evening as they took cover in their foil-lined emergency shelters. "This is as dark a day as I can remember," Gov. Jan Brewer said in a statement. "It may be days or longer before an investigation reveals how this tragedy occurred, but the essence we already know in our hearts: Fighting fires is dangerous work." "Half a million Hydro-Québec customers were without power at rush hour for the second straight day, as widespread outages caused by forest fires in northern Quebec affected transmission lines. The utility said Montreal and other parts of southern Quebec were affected. By 7:30 p.m. most customers had their power restored, and Hydro-Québec tweeted that its three major transmission lines shut down by heat and smoke from forest fires in northern Quebec were operational once again. The blackouts occurred nearly exactly 24 hours after a similar power failure caused by the forest fires, despite the utility's best efforts to protect the network." An evacuation alert is in effect for several homes five kilometres southwest of Okanagan Falls, BC, in the southern Okanagan. The White Lake Road fire was reported at about 3:30 Sunday afternoon and the Regional District of Okanagan Similkameen issued the evacuation notice just before 6 pm. Twelve properties along Willowbrook Road and Yellow Brick Road are affected and residents have been advised to be ready to leave on short notice. "A massive fire spread across a nature reserve in the capital of Argentina on Wednesday, just a few blocks from the city's political and financial center. Authorities suspect an arsonist might have set the blaze. No injuries have been reported and the fire has reportedly been brought under control. " " CALIFORNIA – A wildfire raged out of control in the high desert east of Los Angeles on Wednesday, injuring two firefighters and one civilian and forcing the evacuation of hundreds of residents of three small communities. The fire broke out shortly after 2 p.m. near a back-country road south of Banning, about 90 miles outside Los Angeles in Riverside County. Berlandt said. Shelters had been set up at high schools in nearby Hemet and Beaumont, the department’s website said. Berlandt said several structures had been destroyed by the flames, but it was not immediately clear whether any of them were homes. "California wildfire rages and scorches 6,000 acres in Riverside County"
A wildfire has burnt 6,000 acres in Riverside County, Calfornia as hundreds of people are forced to leave their homes. The blaze broke out shortly after 2pm on Wednesday near a back-country road south of Banning, about 90 miles outside Los Angeles in Riverside County. Within hours it had scorched more than 6,000 acres. Two firefighters have been injured and one civilian. Poppet Flats, Twin Pines and Silent Valley are under mandatory evacuation orders and Highway 243 has been closed. Report by Ashley Fudge"
More than 10,000 homes are threatened by a furious Idaho wildfire, including getaways owned by Arnold Schwarzenegger, Tom Hanks and Bruce Willis, after an all-out “ground and air attack” failed to stop the blaze spreading to more than 126,000 acres, according to latest reports from the U.S. Forest Service. “Take your essentials, belongs and pets and GO NOW,” a news release on inciweb warned those in the path of the lightning-sparked Beaver Creek fire. Despite an army of more than 1,200 firefighters, the blaze continues to spread across parched sagebrush, grasslands and pine forests in the Sun Valley area. “Every fire has a personality, and this fire has an angry personality,” Beth Lund, and incident commander with the U.S. Forest Service team managing the blaze in central Idaho told Reuters. More than 10,000 homes near the towns of Hailey and Ketchum remain threatened by the blaze, including luxury getaways owned by Arnold Schwarzenegger, Tom Hanks and Bruce Willis. "TWO major NSW bushfires have flared up again as firefighters brace for worsening conditions and try to halt the formation of a "mega-fire". The blaze in the Springwood area of the Blue Mountains which last week destroyed 200 homes was this afternoon upgraded to emergency status. And in the NSW Southern Highlands, a major fire that has been burning for days near Wollondilly was again upgraded and residents in the village of Wilton warned burning embers were blowing their way. The new emergencies came as hundreds of firefighters resorted to “high-risk” back-burning strategies against the biggest of the bushfires, the State Mine blaze near Lithgow in the Blue Mountains. 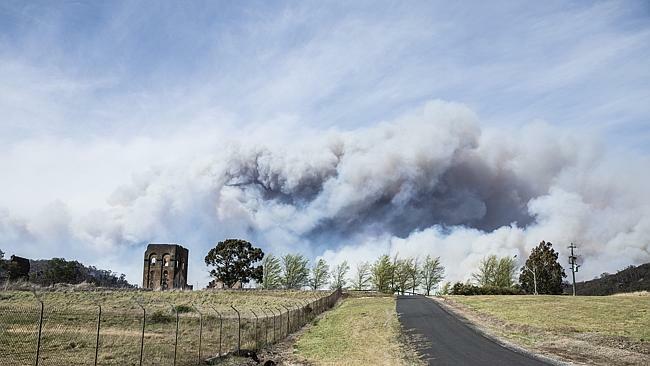 The great fear is that at least three major fires in the Blue Mountains will merge and head toward's Sydney's western suburbs amid worsening conditions on Wednesday. And as firefighters continued to try to save homes, the Insurance Council of Australia said the insurance bill so far was about $94 million, with 855 claims made. Rural Fire Service Commissioner Shane Fitzsimmons said firefighters were today taking “considered” but risky moves to strengthen containment lines around the huge State Mine blaze near Lithgow." There is a video included. This looks perfectly awful, everyone stay safe. "AUSTRALIA - New South Wales is bracing for a potentially devastating day of bushfires, with the state’s fire commissioner urging people not to travel to the Blue Mountains due to conditions that are set to be “as bad as it gets.” The fire danger warning for the greater Sydney area, the Blue Mountains and the Hunter valley has been set to “extreme” – the second highest level. All schools and childcare centers in the Blue Mountains will be closed, with Fitzsimmons urging residents to seriously consider fleeing their homes. “If you are going to leave, leave early,” he said. “Leaving early is always the safest option. Know your fire safety plan and be decisive. Procrastination won’t be helpful,” he said. “We will do everything we can, but it would be wrong of me to provide a guarantee that we will deliver on providing a truck to every home, a message to every person. It is simply something we cannot guarantee, but we will do our absolute dandiest to make sure we can." "BIG SUR, Calif. — Firefighters were expected to get some help Wednesday from the weather as they battle an unusual late fall wildfire that has destroyed more than a dozen homes and forced about 100 people to flee the scenic Big Sur region overlooking the Pacific Ocean. Winds were expected to be calm during the day, and there's a minimal chance of rain. The slow-moving fire in Los Padres National Forest near state Highway 1 had consumed 769 acres, or a little over a square mile, by Tuesday night and was 20 percent contained. Full containment was expected by late Friday. Mark Nunez, the incident commander of the team fighting the fire, said 829 firefighters had deployed to the area, and thus far, weather has been working in their favor." "A massive wildfire in California is taking down large swaths of Southern California, thanks to one of the driest Januarys on record. The primary wildfire is burning in the foothills of the San Gabriel Mountains, near Angeles National Forest, and it looks like hell on earth. Already 125 acres large with 30 acres completely charred, the fire has caused evacuations to be ordered in the surrounding communities and brought 600 firefighters to fight the blaze. The area is about 25 miles northeast of downtown Los Angeles. Here in Western Australia, we've had a couple of bad fires as well - there was one in the Parkerville/Stoneville area just east of Perth last Sunday - 54 houses destroyed, but very lucky not more, and no lives lost. (I was there helping). Now, there are quite a few fires in South Australia and Victoria, houses lost and several lives lost. A wildfire was raging in a highly populated area of Chile early Sunday after killing two people and consuming more than 500 homes, officials said. At least one more person has been injured in the flames that have swept over at least 660 acres, said Chile’s National Emergency Office (ONEMI). 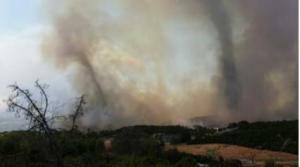 Strong winds fanned the flames into Valparaiso and Viña del Mar, two adjacent cities on the Pacific coast, ONEMI said. “It’s been one of the worst fires in history,” said Vina del Mar fire superintendent, Fernando Reseio, who has been a firefighter for 30 years. 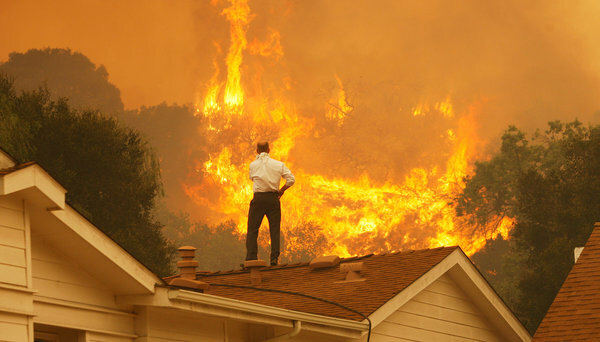 "SAN DIEGO (AP) — A fast-moving wildfire ignited hillsides and destroyed more than two dozen homes Wednesday in the coastal city of Carlsbad as weary firefighters scrambled to control multiple blazes in Southern California on the second day of a sweltering heat wave. Mandatory evacuations were in progress, and more than 11,000 notices were sent to homes and businesses. Local TV broadcasts showed the blaze engulfing suburban-style homes with manicured lawns." BREAKING PHOTO: Fire tornado seen during brush fire in Fallbrook, California. CRAZY PIC: Multiple smoke-filled fire tornadoes seen during fire in Bonsall, Calif.
"Rides at Legoland have been evacuated because of power outages related to the wildfires sweeping San Diego County, according to the theme park. 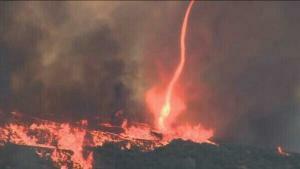 Homes in the Carlsbad area were in flames, but the exact number was not immediately clear." "An out-of-control brush fire at Camp Pendleton was creeping closer to the San Onofre nuclear power plant, prompting evacuations. A second school and housing area have been evacuated as the brush fire at Camp Pendleton continues to spread. The fire, dubbed the Tomahawk fire, on the northeast section of the base, had burned more than 150 acres as of 1 p.m., according to Cal Fire." "According to the Alaskan Division of Forestry the Funny River fire was very active overnight (May 20) because of low humidity. Currently the fire is estimated to be near 7,000 acres and has reached Tustumena Lake. It is spreading east and west along the shore, is 10 miles long, and is about a mile wide with broadening at the lake shore. There have been no evacuations or reports of any structures lost. "The Skunk Fire which began as a lightning strike on Saturday, April 19 is currently 31,167 acres large including fire growth and back burns.The fire continues to move in a north westerly direction and an easterly direction towards ponderosa pine forest. South and North side of the fire is contained. The terrain for this fire is steep with scattered boulders making firefighting more difficult. The entire fire is currently 44% contained and full containment is expected by Friday, May 23, according to Inciweb.org. The National Weather Service has forecast maximum temperatures between 78-93 degrees for May 20. Southwest winds around 10 -15 miles and increasing to 20 mph in the afternoon with gusts to 30 mph. Ridge tops wind will be southwest 20-25 mph." "(CNN) -- Authorities asked people to evacuate 1,000 structures near a wildfire in Alaska's Kenai National Wildlife Refuge on Sunday as the blaze spread. The voluntary evacuation notice was issued for structures near the blaze on Sunday, Weston said. So far, no structures have burned in the fire. Earlier Sunday, emergency officials said windy weather was pushing the fire further into the refuge and away from homes." "BREWSTER, Wash. — The town of Malott and areas around Brewster were evacuated Friday night as hundreds of more people fled a devastating wildfire that had already scorched nearly 170,000 acres and destroyed up to 100 homes in north-central Washington. On Friday night, authorities ordered the evacuation of the small town of Malott, Wash., population of about 500, and people from the outskirts of the larger town of Brewster, which is home to about 2,400 people." "A wildfire has burned between 300 and 500 acres near Foresta in Yosemite National Park on Saturday afternoon and caused mandatory evacuations for the community of Foresta, said park spokeswoman Kari Cobb. It started mid-afternoon and was moving northeast and uphill, towards Foresta's big meadow, Cobb said. The road is closed at the Highway 140 and 120 junction all the way to the Crane Flat gas station -- currently preventing motorists from driving to Tuolumne Meadows from Yosemite Valley." DENVER — This year’s below-average wildfire season comes as welcome news for Westerners, but it’s also burning a hole in the environmentalist narrative on climate change. Although summer isn’t over, and fires are burning in California and Oregon, it has been a mild year in terms of the number of wildfires and acres burned, according to the National Interagency Fire Center. The agency reports that 2.77 million acres have burned this year as of Sept. 5, a decline from the 3.9 million acres that had burned by the same date in 2013 and less than half the 10-year average of 6.2 million acres. The number of fires, 38,451, is also down considerably from the 10-year average of 56,278. That reduction is even more impressive given that the Pacific Northwest was hit with an above-average wildfire season. In July Washington suffered the most destructive fire in its history, the Carlton Complex Fire, which burned 252,000 acres and destroyed 300 homes in the state’s north-central region." This one from Reddwolf, Tx. 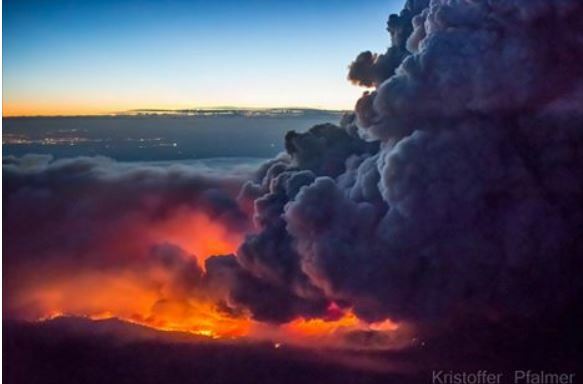 California’s giant King fire continues to burn. Here’s how it looks from above. "The California Department of Forestry and Fire Protection has had an especially busy year, responding to 4,974 fires through Saturday — “over 1,000 more than normal,” according to a Cal Fire spokesman. But no conflagration in the state this year has been larger than the King fire, which has spread across so many acres in drought-dried Northern California that it’s now larger than several major American cities, including Atlanta, Las Vegas, Philadelphia and Portland. The wildfire, which began east of Sacramento on Sept. 13, continues to burn through steep, timber-filled terrain. As of Tuesday morning, the King fire covered 89,574 acres and was 35 percent contained, Cal Fire said." "(Reuters) - Evacuation orders were lifted on Sunday for residents near a fast-moving brush fire east of Los Angeles that had threatened more than 200 homes overnight, even though heavy smoke was still menacing the area, fire department officials said. Residents sensitive to smoke were cautioned to stay inside as windy conditions blew the haze around the Prado Dam region, about an hour's drive east of Los Angeles in drought-stricken California." Avakov says the Ukrainian prime minister has called an emergency meeting on how to tackle the situation. Police and National Guard units are on high alert. Ukraine's acting head of emergency services said earlier the forest fires were not a threat to the sarcophagus sealing off Chernobyl's crippled Reactor 4. "A rapidly growing 3,500-acre brush fire near San Bernardino, California has blocked a freeway and set multiple cars on fire. Five homes have been burned and 50 are in danger, fire officials said. The San Bernardino County Fire Department has declared a "mass casualty incident" and hundreds of firefighters have been dispatched to battle the blaze. It's unclear how many may be injured, but the fire department stated that it is preparing to handle "multiple civilian burn victims." A US Forest Service official told KLTA that two minor injuries have been reported." I've been over this pass, and can tell you, that this had to be frightful for those caught.